BEVs, Batteries and the Electrification Future takes an in-depth look at the future of the electric-vehicle market, how automaker EV plans are progressing, where battery technology is headed and how battery suppliers are positioning themselves for near-term growth. OEM Report Card: Which automakers will be best positioned for the EV future state? Exclusive industry survey results: What will drive the EV market? What technology is likely to be the battery game-changer? Are widespread internal-combustion-engine bans by 2030 realistic? There is near-unanimous agreement the automotive industry is nearing the dawn of the age of electrification, with most industry-watchers and insiders expecting some form of battery technology onboard the majority of new vehicles produced and sold in 2030. What’s more difficult to discern is how big the market – currently dominated by hybrid-electric, plug-in hybrid-electric vehicles and, soon, 48V mild hybrids – will be for full-electric vehicles. That likely will hinge on how far government policy goes and how quickly improvements in technology will bring EV costs down and driving range up – two highly fluid factors. 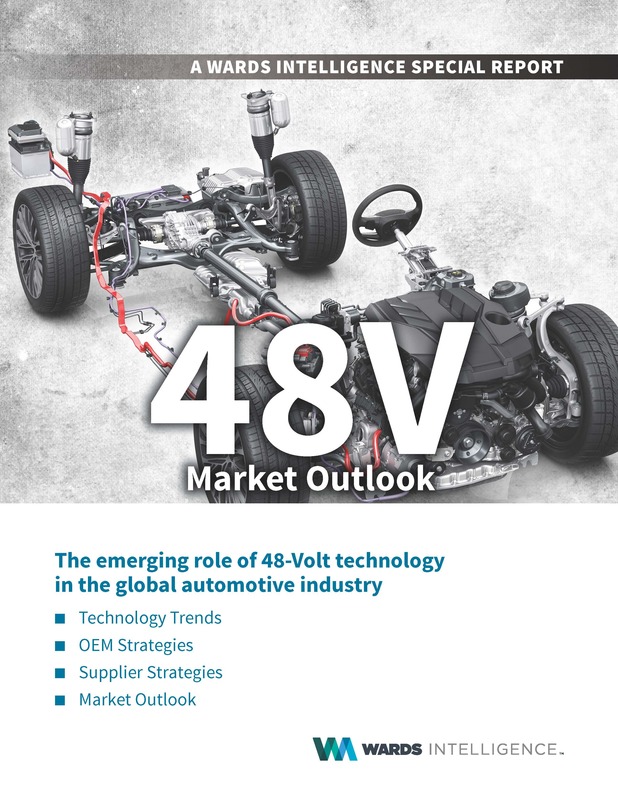 This report takes an in-depth look at the market drivers for EVs, various demand forecasts from a wide range of sources and the aggressive plans by automakers around the world to fill their lineups over the next few years with full EVs. Although the EV market is growing, global sales are likely to remain a single-digit percentage of overall light-vehicle demand annually until after 2025. Despite the conservative near-term volume outlook, automakers are planning to launch no fewer than 85 new battery-powered models by 2025. Battery makers are working on new technology and chemistries that would cut costs and extend range, but lithium-ion will continue to dominate the market well into the next decade. Five suppliers, all based in Asia, will control 75% of the market for EV batteries worldwide. 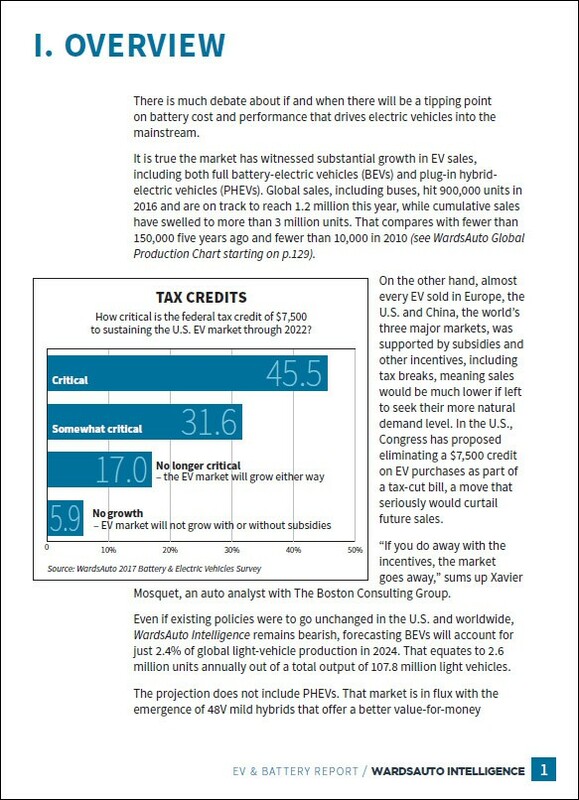 The report also ranks the automakers as to which are best positioned to exploit the expanding EV market and profiles key battery suppliers, detailing their market successes to date, current technology strategies and what may be next and the industry’s Li-ion-battery capacity-expansion plans. BEVs, Batteries and the Electrification Future seeks to answer the question of how big and how fast the EV market will grow and whether the industry is equipped to meet demand – or is on a dangerous path toward investing too much, too soon into battery-electric vehicles. BEVs, Batteries and the Electrification Future includes the WardsAuto Intelligence strategic report card, handicapping OEMs’ strategic preparedness for rapid growth in the EV market. WardsAuto Intelligence’s unique assessment of automaker EV preparedness you won’t find in any other resource.